In a communication sent to Agenzia Fides, the Syriac Orthodox Church claimed that over 90 percent of the Christians of Homs have been expelled by militant Islamists of the Farouq Brigades, who went door to door confiscating homes and forcing Christians to flee without their belongings. Jesuit sources in Homs say most Christians left on their own initiative to escape the conflict between government forces and insurgents. In either case, the Christian population of Homs has dropped from a pre-conflict total of 160,000 to about 1,000. To read the rest, click here. To find out how you can help, follow this link. 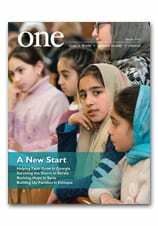 To read a Syrian Jesuit’s firsthand account of the great efforts underway to help those affected by the war — especially children — read the Rev. Ziad Hilal’s Letter from Syria, appearing in the Summer 2013 issue of ONE.